I love my friends! I have lots of great friends that I love spending time with, and today I want to honour each of you, my dear friends. I love how easy it is to create a beautiful card with a circle pattern, using the Stamparatus and a template that is easy to make yourself! Simply use a piece of our acetate window sheets, cut the size of the Stamparatus platform. Draw a large square on a piece of cardboard and cut it out. Trace this on the acetate. Turn 90 degrees and trace again. Cut 1/4 inch off your cardboard square, and repeat. Continue with this until your square is small. 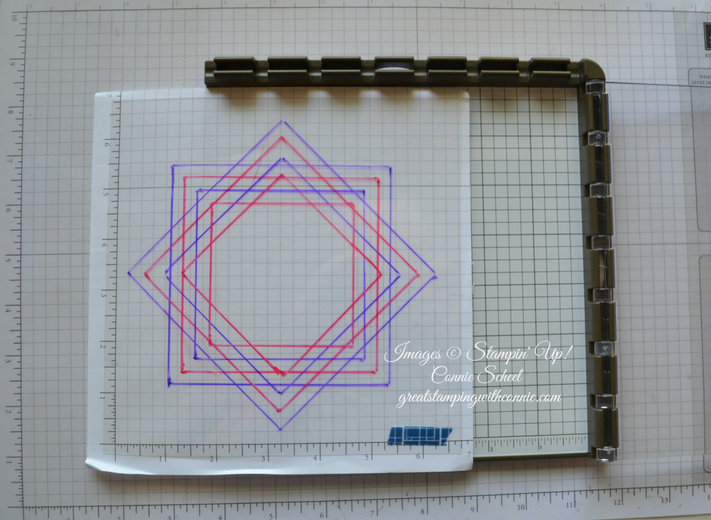 To use your template, cut a piece of square card stock the size of one of your squares. Place it on the acetate and secure with a magnet. Position your stamp, ink and stamp. Turn the cardstock in the template and repeat. Continue until you have a created a beautiful circle pattern with your stamp.